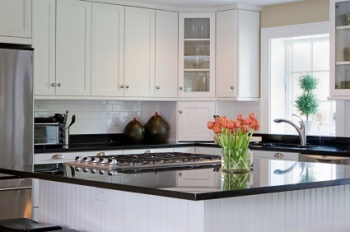 Organize The Kitchen which is undoubtedly the most frequently used room in today's homes! Many kitchens are actually multi-purpose rooms. They are used for doing homework, paperwork and just good old "hanging out. "I love organizing them because they provide the greatest timesaving opportunities for families who are on-the-go. I must warn you, however, you will need to schedule some significant time to get your kitchen reasonably organized. Of course the time your take to organize this room will be returned to you repeatedly. You will be able to cook, bake, work, clean-up and put things away easily because you have a system and a better place for everything. What isn't working? What am I always looking for? What would I like to change? What do I prepare the most? Can I add more storage? Do I have too much in the cabinets? Can I eliminate some of the items on the counters? Do I need drawer dividers? What am I repeatedly doing? The answers to these and other questions will provide the blueprint for your kitchen organizing project. The most effective way to organize a kitchen is to move everything out. If you are willing to tackle this enormous undertaking, it might be wise to hire a Professional Organizer to assist you and to speed up the process. In addition s/he will be able to offer helpful organizing ideas customized to your specific kitchen and encourage you through possible feelings of "overwhelm" as you move back in. If you do not have the time to organize the entire kitchen, start with one cabinet or area at a time. Use Part Of Your Kitchen As A Home Office/Homework Area? If there is an area of the kitchen that is unique to your design and that you would like to get more organized, please use the Contact Us Form. Try to give as much detail as you can and I will send you some more kitchen organizing ideas. Go From Organize The Kitchen To Home Organize It!